The Federal Judicial Center is the research and education agency of the judicial branch of the U.S. government. The Center was established by Congress in 1967 (28 U.S.C. §§ 620–629). At left, the Center’s statutory purpose is superimposed on the photo of the Thurgood Marshall Federal Judiciary Building in Washington, D.C., where the Center is located. The Center's governing board is chaired by the Chief Justice of the United States. The other Board members are seven judges elected by the Judicial Conference of the United States, and the Director of the Administrative Office of the U.S. Courts. The Center conducts research and issues reports on judiciary activities, including case management and court administration, and in cooperation with the Administrative Office of the U.S. Courts maintains a public database of federal cases. The Center educates federal judges and judiciary staff on law, case management, leadership, ethics, and court administration, using in-person programs, online resources, videos, and publications. The Center collects and produces resources on the history of the federal courts, including judicial biographies, caseload data, the evolution of the courts’ structure and jurisdiction, and teaching materials. 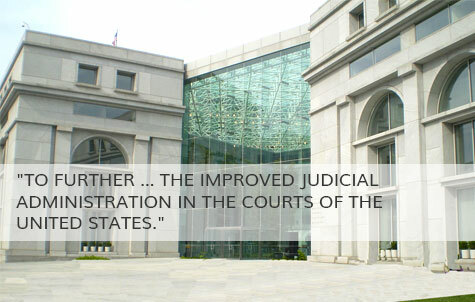 The Center provides information to help improve the administration of justice in other countries and gathers information from abroad that may inform the administration of justice in the United States. View new Center publications, and search the catalog by author, title, and topic. Curated collections of Center resources on discrete areas of law and judicial practice.